As a rule, refrigerators are the most dependable of all large appliances. Even so, they do fail to do their jobs adequately on occasion, and when they do the results can be serious because expensive food can spoil in a hurry. Remember that the best way to lengthen the life of a refrigerator is to clean the condenser coils at least once a year. It is recommended to clean condenser coils on certain types of refrigerators, such as side-by-side and built-in models, at least twice a year. Our technicians are factory trained to service and repair most makes and models of refrigerators. Please call (888) 431-3472 if you require assistance or would like to schedule an appointment. Today's kitchens are loaded with sophisticated cabinetry, countertops, storage devices, preparation centers, and much more. But, fundamentally, kitchens are for cooking. With this fact in mind, it only makes sense that cooking appliances are critical to the function of a kitchen. 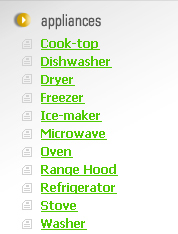 We employ a variety of these appliances and give them several different names: ovens, ranges, stoves, stovetops, cooktops, and more. All are designed to fry, boil, broil, roast, and otherwise cook foods. The key to keeping a kitchen range operating properly is to clean it regularly. Beyond that basic maintenance, only a couple of repair jobs are within the skills of most homeowners because most repairs require a thorough understanding of the appliance. Our technicians are factory trained to service and repair most makes and models of cook-tops. Please call (888) 431-3472 if you require assistance or would like to schedule an appointment. Because an estimated two-thirds of U.S. households have dishwashers, it’s likely that you are already well-acquainted with the joys of using one. If so, you know that a dishwasher cuts valuable time off your chores, minimizes kitchen clutter, and uses less water to do a better job than does hand-washing. The vanguard of today’s dishwashers have really come of age. They do their job quietly and efficiently, using much less energy and water than models made just a few years ago. And they have intelligent controls that maximize the ease of using them. Our technicians are factory trained to service and repair most makes and models of dishwashers. Please call (888) 431-3472 if you require assistance or would like to schedule an appointment. Clothes dryers are among the truly convenient appliances of modern life and, where the space and utilities are available for operating one, a dryer is the natural companion to an automatic washing machine. Clothes dryer problems generally occur because the heat source doesn’t heat properly or the motor fails to turn the drum. If a gas dryer doesn’t dry properly, the first thing to check is the pilot light or igniter—it may not be lighting the burner (exercise care). The second thing to check is the dryer’s vent—if it is clogged with lint, the heating system won’t work properly. Our technicians are factory trained to service and repair most makes and models of dryers. Please call (888) 431-3472 if you require assistance or would like to schedule an appointment. When a standard refrigerator/freezer combination just doesn’t offer enough space for frozen food and, there are separate freezer units. Freezers are usually used for more long-term storage of bulk and seldom-used food items. Our technicians are factory trained to service and repair most makes and models of freezers. Please call (888) 431-3472 if you require assistance or would like to schedule an appointment. Ice makers need to be maintained in order for them to last a long time. In some cases, an ice maker can break down because of overuse or it could also be due to lack of care for the device. Our technicians are factory trained to service and repair most makes and models of ice makers. Please call (888) 431-3472 if you require assistance or would like to schedule an appointment. Today, it's estimated that 90% of American homes have a microwave oven in the kitchen. When it comes to cooking quickly and efficiently, they can't be beat. With this in mind, they are great for reheating pizza, thawing frozen foods, popping popcorn, and much more. In addition to saving time, a microwave oven also saves energy. It can eliminate a tremendous amount of wasted energy in the kitchen, from the energy needed to preheat a conventional oven to the waste involved in heating a kettle of water when all you need is a cup. 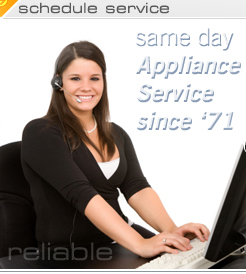 Our technicians are factory trained to service and repair most makes and models of microwaves. Please call (888) 431-3472 if you require assistance or would like to schedule an appointment. When foods come out burned, soggy, or unevenly baked, it generally means heat isn't being distributed evenly throughout the oven, it's escaping out the door, or the controls are out of adjustment. When an oven doesn't maintain the set temperature, first make sure no one is allowing the heat to escape by opening its door. If not, the oven control either needs to be re-calibrated or replaced. Our technicians are factory trained to service and repair most makes and models of ovens. Please call (888) 431-3472 if you require assistance or would like to schedule an appointment. The purpose of a hood is to collect cooking contaminants and hold them until the blower unit can exhaust them to the outside. If you have smoke in the kitchen when you cook or, can smell the food long after you cook it's time to call a professional. Our technicians are factory trained to service and repair most makes and models of range hoods. Please call (888) 431-3472 if you require assistance or would like to schedule an appointment. As more and more features of ranges become computerized, the list of things you can do to repair them yourself grows smaller and smaller. On a gas range, if the burners don't light, be sure the pilot light is lit (Note: If your appliance has electronic ignition, it doesn't have a pilot light). Our technicians are factory trained to service and repair most makes and models of stoves. Please call (888) 431-3472 if you require assistance or would like to schedule an appointment. A washing machine is a rather simple appliance. It connects to the hot and cold water supplies, has a motorized tub that fills with water and churns the clothes, and has a drain that empties the tub. But, of course, contemporary washing machines are much, much more. They automate just about every task involved in cleaning clothes. To do their job, automatic washers use a considerable amount of water and electricity. Just how much of both depends upon the efficiency and performance features built into a particular model. Many features are available to boost how efficiently a washing machine performs. Our technicians are factory trained to service and repair most makes and models of washers. Please call (888) 431-3472 if you require assistance or would like to schedule an appointment.